21 January 2013 – Heathrow’s Terminal 2: The Queen’s Terminal by Luis Vidal + Architects (LVA) will open on 4 June 2014, when a United Airlines flight from Chicago is scheduled to land at the new building in the early morning. Over half a century since the Queen opened Heathrow’s original Terminal 2, the new Terminal 2 will be home to 22 Star Alliances airlines as well as Aer Lingus, Virgin Atlantic Little Red and Germanwings carriers. The £2.5 billion development has taken five years to complete and includes the main Terminal 2 building, a monumental new sculpture inspired by the world of aviation by internationally-renowned artist Richard Wilson RA, a 1,340-space car park and an energy centre and cooling station. Spanish architect Luis Vidal is internationally renowned for his ambitious airport designs. His practice Luis Vidal + Architects (LVA) has worked on the Madrid Barajas Airport; the Zaragoza Airport, also in Spain; the new Warsaw International Airport, as well as nine other international airport projects. Consistent with many of Vidal’s previous airport designs, Terminal 2 will be characterised by a bold undulating steel-framed roof. The roof will feature three large waves emphasising the three main parts of the passenger journey: check-in, security control and boarding. The roof orientation contributes to passenger perception and comfort inside the terminal by providing consistent and steady light quality. Natural light entering from the north penetrates the building and floods the floor plate at all times of the day. The underside of the roof is covered with a material which helps bounce natural light during the day and assists the reflection of artificial light at night. Additionally, the striking roof design will support the environmental credentials of the building. By orienting the roof to the north, it provides a generous presence of natural light, while also benefiting from a reduction in solar gain and energy consumption. As Heathrow’s most sustainable terminal yet, Terminal 2 reduces CO2 emissions by 40% compared to the buildings it replaces and will be the UK’s first airport to be awarded a BREEAM* rating for its sustainable building design. The Queen’s Terminal has been designed using a modular system which allows faster construction and can sustain future growth. The new terminal has also been chosen as a finalist in three categories (Security, Sustainability and Performance in use) of the Constructing Excellence Awards in London and the South East. Construction of the new building has been completed without disruption to the daily operations of what is the world’s busiest airport. The build has been undertaken by the HETCo joint venture of Ferrovial Agroman and Laing O’Rourke who have succeeded in facing challenges often associated with airport builds such as lifting restrictions and constraints on airside arrivals. Luis Vidal + Architects are the concept and lead architects for Heathrow’s new Terminal 2 and are collaborating with Pascall + Watson during the fit out phase. Foster + Partners were the Heathrow Airport master planners and the East terminal building concept architects during the initial project phase. Terminal 2 is one of the UK’s largest privately funded construction projects. All the investment at Heathrow has been funded by Heathrow Airport Ltd, without any cost to the taxpayer. By the time of opening in June 2014, approximately 35,000 people will have worked on the project with as many as 5,000 people a day on-site at its peak. Many of the larger components of the project – from structural steelwork to the component parts of Richard Wilson’s Slipstream sculpture – have been manufactured inside and around the UK. John Holland-Kaye, Heathrow Development Director, said: “Terminal 2 has been designed with the passenger at the heart. Building on the success of Terminal 5, it will bring together technology, architecture and human touches. Our goal is to make every journey better for our passengers and bringing together 25 airlines in this light and airy space is just one more step in the transformation of Heathrow.” Luis Vidal commented “Airports are the Cathedrals of the 21st Century; they are the gateways to nations, and serve a public function. That is why they must look into the future and adapt themselves to changes and challenges. The old Terminal 2, opened by the Queen in 1955, was demolished after 54 years of service. It was Heathrow’s first terminal, originally called the “Europa Building” and was designed to deal with 1.2 million passengers a year. By the time it closed in 2009 it was handling 8 million passengers a year. The new Terminal 2 marks the latest phase of an £11 billion transformation of Heathrow. Terminal 2 phase 1 is a £2.5 billion development. The main build was completed on schedule in November 2013. By the time the terminal opens for service, it will have undergone 182 trials and been tested by 14,000 people. Some trials will involve more than 3,200 people, with the whole process designed to test the passenger journey as comprehensively as possible. Terminal 2 will be the world’s first airport terminal to be awarded BREEAM rating for its sustainable building design. BREEAM encourages designers, clients and others to think about low carbon and low impact design, minimising the energy demands created by a building before considering energy efficiency and low carbon technologies. Heathrow’s Terminal 2 has been selected by the BREEAM organisation as the standard to define the parameters that need to be fulfilled by an airport building in order to be awarded BREEAM. Luis Vidal was born in Barcelona (1969) and raised in Majorca. He studied Architecture with an emphasis on airports and transportation infrastructure at the University of Greenwich (London, UK). In 1995 he was elected the youngest member of the Royal Institute of British Architects (RIBA). Luis Vidal + Architects was founded in 2004 and has since developed more than 80 projects of different scales; achieving worldwide recognition for its expertise in the field of airports and transportation architecture. LVA has created 21st Century airports that embrace flexibility, cutting-edge technology, environmental responsibility and efficiency, thus enhancing passenger experience and maintaining a proven track record of delivering on time and on budget. LVA represents responsible architecture by providing economic, social and environmental sustainability in all of its projects. In addition, LVA has won many awards in the 9 years since its inception. The design for the new Zaragoza Airport was shortlisted as finalist of the Mies Van der Rohe 2009 Awards, the interior design of the Restaurant at the Museum Reina Sofia was winner of the Architecture Prize of the City of Madrid for the Best Commercial Establishment 2005, and Can Misses Hospital in Ibiza and Vigo’s New Hospital in Galicia won the Design & Health International Awards in the Future Health Project category in 2012. LVA is also currently involved in designing the world’s first commercial space port; the firm has been appointed Associate Architects to the American engineering and architecture firm HDR for the design of Front Range Spaceport outside of Denver, Colorado. A newly published book on Luis Vidal + Architects by Lawrence King focuses on the working process behind the practice, emphasizing the role of collaboration with clients, other architects and designers and the importance of cross-disciplinary approaches and lateral thinking. Created by internationally renowned British artist Richard Wilson RA and curated by public arts agency Futurecity, Slipstream is an ambitious artwork inspired by the world of aviation which combines precision engineering and specialised UK craftsmanship. Slipstream was manufactured in Hull by Commercial Systems International. The sculpture is 70 metres long, weighs 77 tonnes and is made up of 23 separate sections, all of which were transported piece by piece from Hull to Heathrow. The result is a flowing, twisting aluminium form; an imagined flight path of a Zivko Edge 540 stunt plane. 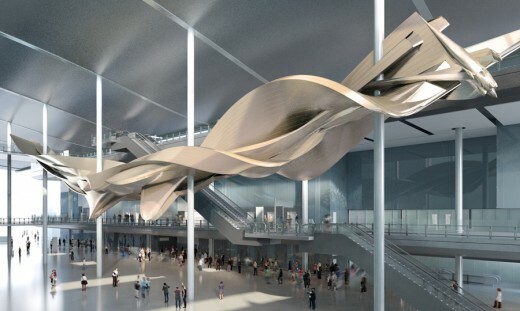 The sculpture will carve through the open space of Terminal 2’s Covered Court as a stunt plane might and will be seen by over 20 million passengers a year when the terminal opens to the public from 4 June 2014.